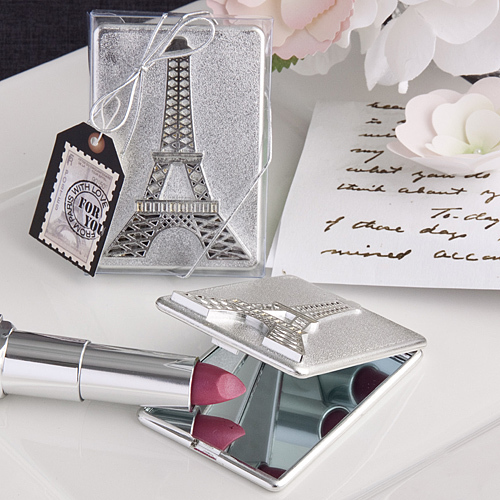 Each Paris compact mirror measures 3” x 2”. Rectangular case is crafted in hard molded plastic with a textured shiny silver finish. Raised Eiffel Tower design is detailed and really pops against the textured background. Opens at a top hinge to reveal a dual glass mirror interior. Packaged in a clear display box with a metallic silver ribbon wrap and bow. Attached is a postage stamp design “For You” tag with a “From Paris with Love” message.